Bono and The Edge accepted the Palm Springs International Film Festival’s Visionary Award recently on behalf of U2 with a speech on the power of activism and American bipartisan leadership in delivering more antiretroviral treatment to AIDS patients. 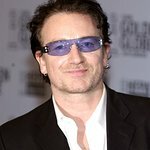 This is the first time the award was given to someone other than a filmmaker, and Bono took the opportunity to speak about his band’s advocacy work. The following is a transcript of his entire speech, which Bono delivered at the awards gala on Saturday night. “I guess this is an award for not shutting up and sticking to what you’re good at. This is kind of an award for being a pain in the arse, isn’t it? That’s what this is. And we do understand that people find it insufferable when artists stray out of their box, but for a lot of us in this room, that is the definition being an artist, straying out of your box. “It is worth mentioning that more people live off their imaginations in California than any other place in the world. No other geography comes close. People around here like to ask questions about the real as well as the imaginary world, and this, of course, is the start of being annoying. Demanding answers is when you upgrade to the proper pain in the arse status of the activist, although some people here have managed to do the activist thing without being annoying. “I am of course thinking of Jane Fonda. How could you not? I’m thinking of Meryl Streep in “Sophie’s Choice.” Steve McQueen has challenged intolerance his entire career. Idris Elba, Naomie Harris were activists long before they took on the giant lives of the Mandelas. Julia Roberts, before she took on “Erin Brockovich,” she was an activist and is an activist, and an extraordinary movie star, the definition of, I would say. And we’d like to pause for a minute to consider our Chairman, Tom Hanks, and his stigma-defying, game-changing role in “Philadelphia.” And what Matthew McConaughey has done again now in “Dallas Buyers Club.” Extraordinary performances. “HIV/AIDS has stolen so many lives in this country. 650,000 to be exact, and 23 million lives outside of this country. What people like Harvey Weinstein and groups like amfAR did for the domestic AIDS problem, ONE and (RED) and many others are trying to do for the global AIDS crisis. Our one simple belief is that where you live should not decide whether you live. “Now our leader in this campaign lost a son to the disease. His name was Nelson Mandela, the greatest activist of them all. His genius was a refusal to hate, not because he hadn’t experienced rage, but because he thought love would do a better job. His cleverness was to put aside tribalism and partisanship, the kind of partisanship, I think you’ll agree, that has betrayed this great nation and the great American idea at the heart of it, even in the last couple of years. “It’s ironic that by following an African’s example, American and European AIDS activists like ONE were successful in encouraging Democrats and Republicans here in the US to put aside their differences and work together on what is turning out to be the largest health intervention in the history of medicine. Thank you, America. “You probably don’t know this, but there are now 10 million lives in the developing world saved by antiretroviral therapy, and American taxpayers have paid for about three quarters of them. Thank you, America. 7.8 million sentient souls are alive because of AIDS drugs that the United States of America paid for, and they are not just alive, but allowed to thrive, to have healthy kids, to be alive to raise those kids, to work, to contribute to their economies. And we’re at the tipping point — amazing to be able to say this — we are actually at the tipping point if we keep up the pressure. “We are within reach of declaring the first AIDS-free generation. What a thought. What a thought for this community. And it’s down to the activism of this generation, actors, directors, producers, musicians, but also students, doctors, nurses, priests, NASCAR drivers, soccer moms, CEOs, NGOs, politicians, people who just don’t normally hang out together not just hanging out together but working together. And that’s what it takes.